Happy Sunday! In case you didn’t hear, this year’s Groundhog Day produced a mixed bag of predictions about the future of winter in Canada. Surprising absolutely no one, Quebec’s own Fred la marmotte predicted a late spring. Let’s all hope for the best and keep warm in the meanwhile. Start your day with a smile and read how this person took cat-fishing to a whole ‘nother level by pretending to be a Young Joseph Stalin on Tinder. Spoiler alert: it worked (weirdly) well. Throughout his presidency, publications such as the New York Times and Washington Post have published articles likening Donald Trump to Machiavelli’s ideal ruler. In doing so, they describe Trump as “Machiavellian,” a term often associated with deceitful and ruthless individuals. Yet Machiavelli’s advice to the princes of his day is far more nuanced than these articles, and the term “Machiavellian,” presuppose. Machiavelli’s now infamous work, The Prince, was intended as a treatise on and guide to maintaining political power. It rested on the assumption that human nature is insecure and violent, thereby necessitating an effective leader to be feared rather than loved. Thus, a prince must focus on those virtues that allow him to do what is necessary to maintain power. Yet the maintenance of power also benefits his subjects: as morality in relations can occur only where security is achieved, the prince has a duty to ensure security over given rights. At times, this may require violence, though, as the prince must avoid being hated, only as a last resort. Thus he should also strive to appear honest, though, when necessary, he may lie when doing so suits his purposes. Machiavelli further argues that the prince should further bolster his image listening to the counsel of good advisors and avoiding flatterers. As such, the common use of “Machiavellian” applies only to some aspects of an ideal prince, who, though not necessarily a benevolent ruler, is not as self-interested or brutal as the term implies. Indeed, it seems almost inevitable that many modern politicians, including but not limited to Trump, exhibit some “Machiavellian” traits. However, this is no cause for panic – we are far from being ruled by the autocratic princes for whom Machiavelli’s political guide was intended. This Saturday, February 2, President Putin announced that Russia is no longer obeying the Intermediate-Range Nuclear Forces Treaty, a key nuclear disarmament pact. This is not a surprising move considering that the United States announced plans to pull out of the treaty this past October and stopped observing it on February 1, but is still a devastating sign of the disintegration of global nuclear disarmament. Discussing the decision to cease obeying the treaty, Putin explained that “our response will be symmetrical. Our American partners announced that they are suspending their participation in the I.N.F. Treaty and we are suspending it too. They said that they are engaged in research, development and design work, and we will do the same.” This kind of measure for measure weapons development is frighteningly reminiscent of a Cold War arms race. There is no doubt that with both Russia and the U.S. putting new effort into developing, not disarming, nuclear weapons, the future of global security is uncertain. This week, the US breathed a collective sigh of relief at the end of the longest shut-down in American history. Don’t relax just yet, however – the deal only secures a temporary end to the shut-down. Evelyne Goulet takes us into the last 24 hours of the debacle. All parties involved now have three weeks to come up with a compromise on border security. If this does not happen, which is the more likely scenario, there risks being another shutdown after February 15th. For the sake of the hundreds of thousands of federal workers who have not received paycheques for the past month, let’s hope the government will stay open for more than three weeks. Chris Cadogan discusses the domestic group threatening the stability of Colombia: the National Liberation Army (ELN), which launched terrorist attacks earlier this month. After decades of civil war, the ELN’s actions put Colombia’s delicate peace in peril. Marked as the deadliest attack with explosives in the city since 2003, the bombing emulates decades of turmoil seen between the Revolutionary Armed Forces of Colombia – People’s Army (FARC-EP) and the right-winged Colombian government. When it comes to the US and China, it seems like the on-going trade war between the two superpowers captures all our attention. But Erin Wen analyzes another dimension to the relationship that’s equally important, and perhaps even more dangerous: Taiwan. Keeping up with Venezuela, Omar Arafeh examines why the military has remained loyal to the embattled President Nicolas Maduro. The support from this powerful domestic actor clashes with the international community’s condemnation of Maduro and support for opposition leader Juan Guaidó. However, power and money are not what cements the military hierarchy’s support for Maduro. It is the fear of retribution… A new opposition government taking power could mean hundreds of officers being put on trial for crimes against the Venezuelan people. 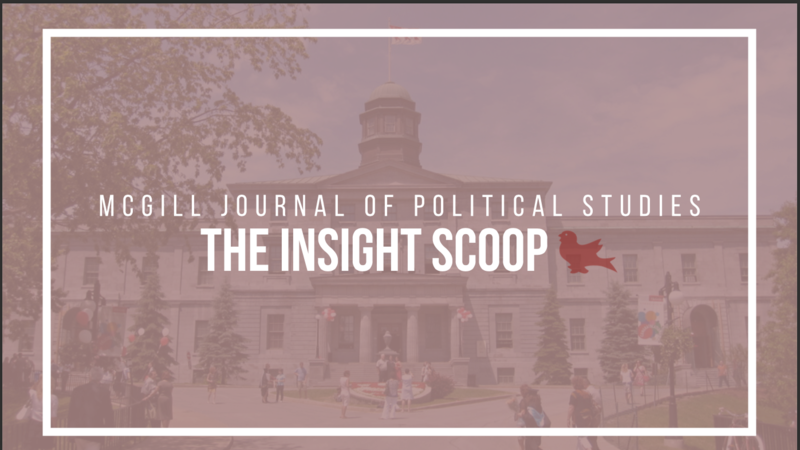 Jane Warren examines the politics of Cabinet selection in light of the Trudeau government’s latest Cabinet shuffle. The competing ideologies of equality of opportunity vs. equality of outcome feature heavily in contemporary discourse about the right and just of representation. While equality of opportunity and equality of respect potentially conflict in the Cabinet-making process, Canada should use these views as mutually-beneficial. By doing so, Canadian leaders could create a collective decision-making body that is representative while securing the qualificative integrity of its individual members. Nikita Tafazoli takes us far from home in her latest discussion of the Canadian space program and its budgeting controversy. The value in the CSA is perhaps not obvious to the everyday citizen, leading to an ongoing issue of undervaluing the paramount importance of space understanding and exploration. Chanel MacDiarmid, on the other hand, keeps it close to home – right in the heart of the home, in fact, with her analysis of the political dimension of the updated Canada Food Guide. Eating breakfast or cooking dinner usually feels very removed from politics. But the reality is that the food we eat – and the food our governments encourage us to eat – has political motives and consequences. Montreal’s Venezuelan community to protest Maduro, human rights – Via CTV News. Quebec government asks Montreal school boards if information on staffers wearing religious symbols exists – via The Globe And Mail.